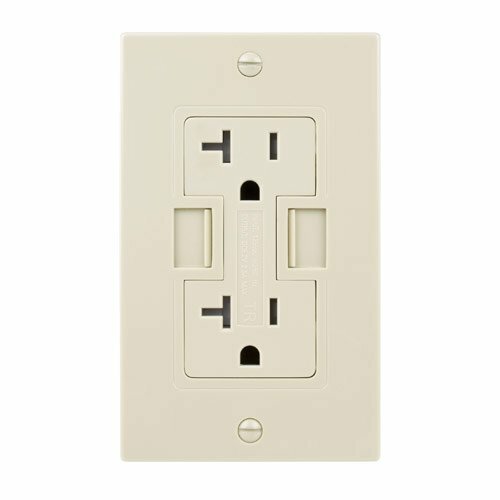 Dual-socket wall outlet with two integrated USB ports. The Power2U provides two traditional 20A power outlets, plus two USB ports delivering 2.5A for fast charging of USB devices. Fully UL-listed featuring NEC-compliant, tamper-resistant AC sockets. Power2U meets all building codes safe for use in homes offices. the Power2U a smart, environmentally friendly energy decision reduces cost of monthly energy bill. Compatibility: Apple iPad iPhone iPod Android tablet phones computers cellphones Bluetooth headsets digital cameras GPS devices charge via standard USB plug. Electrical Requirements: 12 Gauge (20A) Electrical Circuit; 16 Cubic Inch or larger single gang electrical box. Electrical Specifications: Self grounding: self; Voltage: 125 Volt; NEMA: 5-20R Compliant; Pole: 2; Wire: 3; DC power SPECS : 5.2 volt, 2500mA (12.5W) Duplex USB charging receptacle with integrated on/off safety switch for USB power; Dielectric Voltage: Withstands 2000V per UL 498;Overload Test, HP Ratings: 125V AC 58.8A;Current Limiting: Full Rated Current. Materials Specifications: Face & Body Material: Polycarbonate; Line Contacts: Brass triple-wipe .031 thick; Terminal Screws: Brass 10-32; Grounding Screw: Brass 8-32; Strap Material: Zinc-plated steel; Clamp Nuts: Zinc-plated steel; Ground Clips: Brass-Plated. Compatible Electrical Boxes: Nail-on Romex Boxes (Plastic): Carlon BH122A, Carlon B122A, Carlon B120A, Allied Moulded 1098, Allied Moulded 1096; Nail-on Romex Boxes (Metal): Steel City 74-ONCS, Raco 240; Screw-on Romex Boxes (Metal): Steel City CXWV, Steel City PLXWV, Raco 8240 (4" Square); Cut-in Boxes for Romex: Carlon BH118R, Carlon B120R, Cantex EZ21SO, Cut-in Conduit Boxes: Carlon BH118R; Compliances: UL/CUL Listed (E339607); 2008 National Electrical Code (NEC) compliant tamper-resistant AC receptacles. Patented (US 7,997,925 B2) design charges iPads iPhones iPods Android tablets phones tablet computers MP3 players GPS devices digital cameras USB 2.0 chargeable devices.